Soak in the sun with these oceanside walks. A thin layer of melting snow slid under her boots as she slowly picked her way along the wide trail, holding out her arms for balance. In the shade of tall spruce and fir trees, winter lingered, but as she emerged from the dense forest, her boot found purchase on bare granite. There in a small clearing, the steady sunlight had melted away the last frozen layer of winter and twisted pitch pines basked in the light. As she neared the end of the Wonderland Trail in Acadia National Park, her adventure had just begun. Stepping off the trail and onto the beach, she looked out over an expanse of sand, pebbles, shells and tidal pools. At low tide, it was quite a walk to reach the water’s edge, and there was much to see along the way — colors and textures that would cheer anyone out of the doldrums of a long winter. Blocks of pink granite crowded the edge of the beach, coated with yellow-orange lichen. An old lobster trap, crumpled and full of debris, sat at high tide mark, surrounded by driftwood smoothed by the waves. Farther out, clam and slipper shells dotted patches of silky sand, and the bright blue sky reflected in water, where purple dulse and green sea lettuce waved in the current. She took off her winter hat and sat down to soak up the sun. To be alone in Wonderland, a place usually crowded with tourists in the summer, was a special treat. But she wasn’t entirely alone. Gulls cried out constantly as they fished in the shallows nearby, and as she sat there on the rock, a mink emerged from a pile of rockweed nearby. Its brown fur matted with salt water, the creature peered at her with dark beady eyes for a long moment before ducking back into its salty hideout. One of the easiest hikes in Acadia National Park, Wonderland Trail is a family favorite that leads to an interesting beach that includes areas of tumbled granite, sandy pockets, an abundance of shells and vernal pools teeming with ocean life. The hike is just 1.4 miles, out and back, and the trail is fairly wide and smooth, traveling through a stand of twisted pitch pines before reaching the shore. This trail shouldn’t be too muddy in the early spring, considering much of it is on exposed bedrock and rocky soil. All Acadia National Park visitors are required to pay an entrance fee upon entry May through October, regardless of whether they pass a fee collection gate on their way to the trailhead parking area. The current cost for a passenger car is $25 for a seven-day pass. Dogs are permitted on Wonderland Trail but must be kept on a 6-foot leash at all times. For more information, visit www.nps/gov/acad or call 207-288-3338. Directions: Drive onto Mount Desert Island on Route 3 and veer right after the causeway to head toward Southwest Harbor on Route 102. In 5.2 miles, veer left at the fork and continue on 102 for 11.3 miles, passing through a light in downtown Somesville (at about 5 miles) and the town of Southwest Harbor. At 11.3 miles, you’ll come to a fork; veer left onto Route 102A and drive 4.1 miles to the parking lot for Wonderland Trail, which will be on your left. About 3.5 miles of intersecting trails thread through the 145-acre Edgar M. Tennis Preserve, which is maintained by the Island Heritage Trust and Maine Department of Conservation. The trails that hug the shoreline are the most challenging because they’re especially hilly and uneven, with plenty of exposed tree roots and rocks. The trail network is divided by a road. On the east side of the road, two miles of trails lead to stunning views of the ocean, a beautiful small beach, an old cemetery and the foundations of Pickering Farm. And on the west side of the road, about 1.5 miles of intersecting trails lead to views of the ocean and the foundations of the Davis Farm. As you visit the foundations of old homesteads and the tombstones of previous landowners, it’s impossible not to think about the land’s history and how it must have appeared quite different just a few decades ago. Admission to the preserve is free, and dogs are permitted if on leash. For more information, visit islandheritagetrust.org or call 207-348-2455. Directions: Driving south through Deer Isle village on Route 15, turn left onto Sunshine Road, which is across from Mill Pond Mobil. Follow Sunshine Road for about 2.5 miles, then turn right onto Tennis Road. Follow Tennis Road less than 0.5 mile to the preserve, which is marked by several signs. Four small parking areas for the preserve are located along the gravel road. To protect fragile plants, only park in designated spaces. If they’re all full, the Island Heritage Trust asks that you return another time. Connected to the mainland by a causeway, the 936-acre Sears Island is a popular place for hikers, hunters, dog walkers and beachcombers. The island is owned by the State of Maine and features an extensive network of hiking trails that altogether total about 6 miles, and two roads thats are closed to vehicle traffic but used heavily by walkers and bicyclists. A popular challenge for visitors to Sears Island is hiking all the way around the island on the beach, about a 5-mile trip. This adventure can be disrupted at high tide, when the water reaches all the way to the grassy shore, so plan this particular walk with the schedule of the tide in mind. As you walk around the island, the beach will change from rocky to sandy and back again. You’ll find natural gardens of rockweed, piles of driftwood and plenty of sea glass and shells. Admission to the island is free, and dogs are permitted. 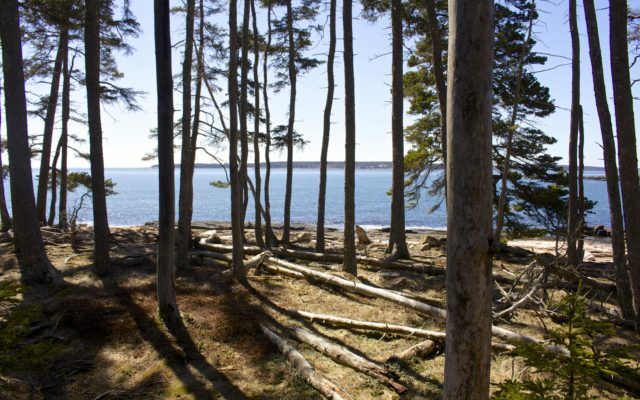 For more information about the island, including planned nature walks and volunteer opportunities, visit friendsofsearsisland.org or call 207-548-0142. Directions: From the downtown area of Searsport, drive northeast on Route 1 to Sears Island Road, which is exactly 1.8 miles from the Searsport Full Gospel Church. Drive all the way down Sears Island Road and out onto the causeway. A gate closes the road to vehicle traffic at the end of the causeway, so you must park outside the gate and continue on foot or bike. Simply park on the causeway out of the way of the gate and leaving room for traffic flow.